Interim head coach Tim Sherwood says Tottenham must choose their next manager quickly as Dutch media suggest Louis van Gaal could take over after next year's World Cup in Brazil. Sherwood, who wants the job on a full-time basis, guided Spurs to a 3-2 win at Southampton on Sunday. Van Gaal wants to stay as Netherlands coach until next summer. "I've always said that I want to work in the Premier League, so there's a chance," said the 62-year-old. Speaking to Dutch broadcasters NOS, he added: "Everyone who knows me knows I won't do two jobs at the same time." 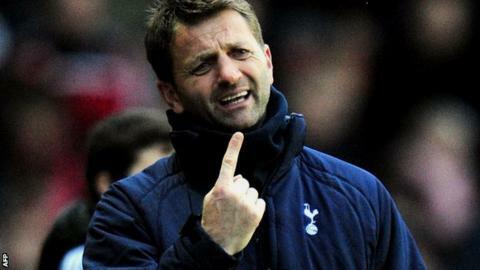 After the win at St Mary's, Sherwood, 44, reiterated his desire to take on the job full-time and said he hoped to speak to chairman Daniel Levy "sooner rather than later". The former Spurs midfielder said: "I don't want the job for 10 minutes. I want it long term or not at all." Dutchman Van Gaal, who has also had stints as manager at Ajax, Barcelona and Bayern Munich, took over as Netherlands coach for a second time last year and his contract expires next summer. Guus Hiddink, Fabio Capello and Michael Laudrup have also been linked with the Tottenham job, while former Spurs manager Glenn Hoddle has also put himself forward. Andre Villas-Boas was dismissed after the 5-0 home defeat by Liverpool left the club five points off the top four. Sunday's win moves them up to seventh in the table, four points off the Champions League places. "These guys need a manager," added Sherwood, who could still be in charge for Thursday's game at home to West Brom. "I enjoyed it today, but one swallow does not make a summer. If we lose on Boxing Day, it is all doom and gloom again. "I will talk to the chairman to see what happens. It has to be right for the club first, then worry about me." Two goals from Emmanuel Adebayor, who had only made one substitute appearance in the Premier League under Villas-Boas this season, helped Spurs to victory at St Mary's Stadium. "You enjoy it when you win, but I did not enjoy the first half," added Sherwood. "I thought we were poor. "Adebayor has not been playing, so he did not require much motivating. You put him back in because of what he has done in history. "He has nothing to prove to me. I have seen him play for many years and we knew he was a top player."